- A new unparalleled strength and stability which allows you to eat whatever you desire. A partial denture has to be removed regularly for cleaning and food particles often get lodged underneath the denture flap making it uncomfortable. The partial can be somewhat loose and can make eating certain foods difficult. A bridge, anchored to dental implants is a much better alternative allowing a 65% chewing capacity compared to the 35% chewing capacity with a partial denture. Traditional dentures/partials cannot offer the same stability or function. As an example, three teeth at the back of the lower jaw are missing. By placing an implant bridge we get a permanent, non-removable solution. The bridge contains all teeth in one piece and is anchored on dental implants. 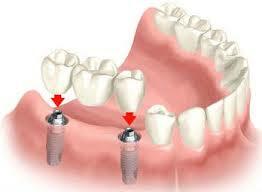 The implants are placed in a single visit. Since the implants need to integrate with the jawbone before the permanent bridge is attached, a temporary bridge may be inserted on the day the implants are placed, making it possible for you to chew normally, almost immediately after leaving the dental office. The permanent bridge is normally placed 2-3 months after the implants have been placed. The end result: Your implant secured bridge will handle all the chewing and biting pressure of healthy, strong, and natural back teeth. You will have a stable and secure solution that allows you choose food selections previously not possible due to missing teeth.